Dynamic wind resistance provides an efficient smooth stroke. The upholstered, padded, sliding seat makes it comfortable and sliding easy even during longer rowing routines. Proven to provide a nearly unsurpassed aerobic workout without the relentless pounding to your joints. For extra convenience, the Stamina® 1403 Air Rower folds to a compact size for easy storage with built-in wheels. Rowing is a great workout. It hits just about every muscle in the body—plus, it’s easy on the joints. Most equipments are just too big. Many people don’t have space for an eight foot long, 200 pound piece of fitness equipment in their home. Thankfully, there are a number of highly effective equipments on the market. You can still get in a great workout without setting up a special room just for your rower. 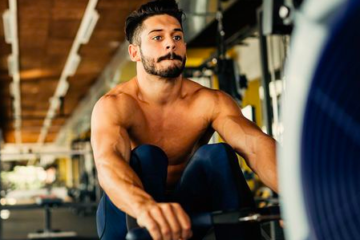 A compact rowing machine is a great way to get in a full body workout without sacrificing too much space or forking over money every month for a gym membership. If you live in a small apartment or just don’t have a lot of storage space, it may still fit in a closet or folded away in the corner of one of your rooms. Most equipments are also fairly lightweight, making them easy to maneuver up and down stairs or across the room when you’re ready to use it. One of the first things you’ll want to consider when picking the right equipment is what type of resistance you want. Each type of resistance has its pros and cons, including price and the space required to operate. More often than not, hydraulic rowers will be the most compact and inexpensive, while air and water resistance rowers will be larger and more expensive. Many equipments fold up into a fairly small package, but are quite large when assembled and ready to use. On the other hand, there are lots of other machines that are very compact when in use. Make sure you pick a model that fits both space needs. Most purchase decisions come down to money, so make sure you have a good idea of what you can spend before looking at rowers. Prices vary widely with rowing machines with budget units available under $200. For a mid-range rower, expect to pay between $300 and $600. And, around $1000 for a higher-end rowing machine. If you’re looking for a simple, reliable rower with plenty of power and flexibility, check out the Stamina ATS Air Rower. This air-powered rower relies on your power output and speed to adjust the effort level. The harder you row, the more intense the resistance becomes. This makes for simple, no frills operation that equates to durability and long term reliability. Progress, distance, time, and more can also be tracked through an LCD monitor. The wide, padded seat of the ATS provides plenty of comfort for bodies of all shapes and sizes. Don’t be intimidated by the size of the ATS air rower. With a collapsible, fold up build, this rower can be quickly folded up for storage and place in a closet or other storage area. 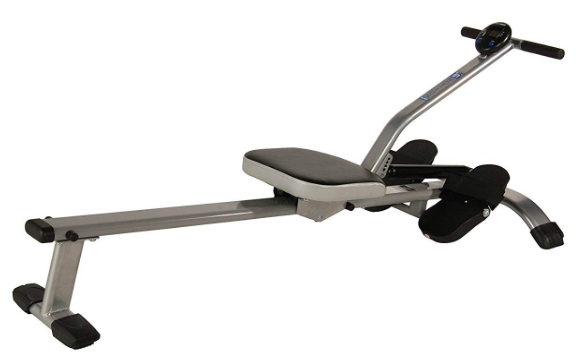 The Stamina Body Trac Glider 1050 is a compact rowing machine that relies on a hydraulic piston for resistance. Users can select from a number of different resistance settings to really dial in the correct intensity. An articulated arm design provides a realistic experience, while a LCD monitor helps users track and monitor activity including time, calories, and other features. The Body Trac Glider 1050’s seat is also fully adjustable, providing space for users of all heights. The maximum weight capacity of 250 pounds may be limiting for some though. Though it doesn’t fold up, one of the top features of this rower is its compact, easily stored design. At just 58 inches long and 48 inches wide, it will comfortably fit in most storage spaces. One of the top equipments available right now is the Sunny Health & Fitness SF-RW5639. This machine stands out with its long, full motion range arms. The longer arms provide for full range of motion—even for those with longer arms. The Sunny Health & Fitness SF-RW5639 is competitive with other models in this price range with its sturdy steel frame, ergonomic seat, and oversized foot rests. A digital, LCD monitor allows users to quickly and easily monitor rowing progress including distance and count. Although it doesn’t fold up for storage, the Sunny Health & Fitness SF-RW5639 is relatively short overall with a length of just 51 inches. 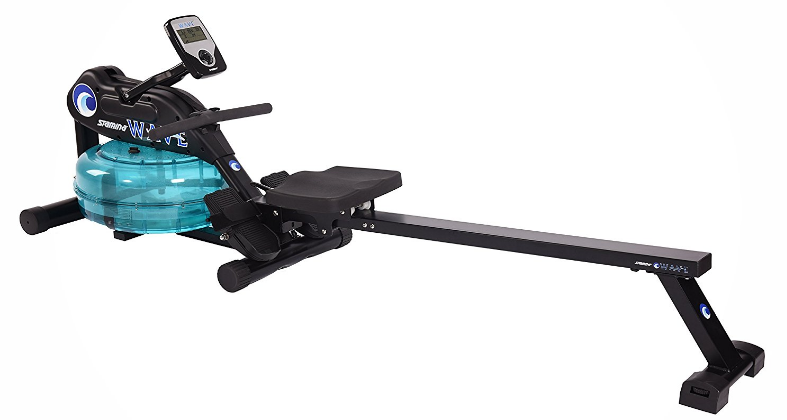 The Stamina 35-1215 Orbital is a compact rowing machine with plenty of high performance features. 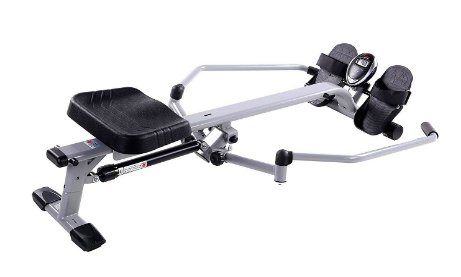 Rather than using a single rowing handle or two that connect and work together, the Stamina 35-1215 Orbital has two handles that operate freely and indecently of each other. 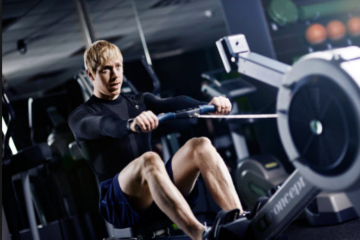 This allows each arm of the rower to work independently, giving the users a complete and balanced full body experience. The Stamina 35-1215’s handles and seat are padded for comfort and the big pivoting foot pedals include straps to help the user’s feet stay positioned while rowing. With a frame made of aluminum, this rower is designed for both strength and to be lightweight. The arms also fold flat on The Stamina 35-1215, making it easy to store out of the way when not in use. 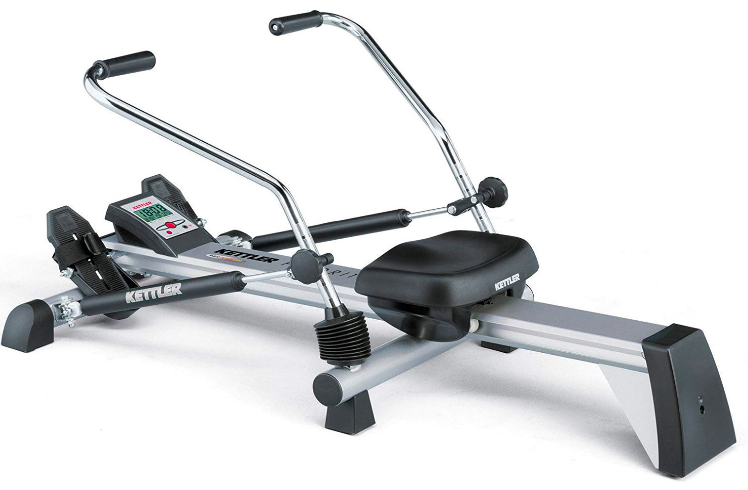 Simple, compact, and easily adjustable, the Kettler Home Exercise/Fitness Equipment: Favorit is another great choice for rowing machine shoppers looking for a more compact piece of fitness equipment. With resistance coming from two heavy duty pistons, the Favorit can be quickly adjusted between a whopping 50 different resistance levels. Users simply turn a knob to a new resistance setting. Instead of just moving faster for more resistance, this rower lets users set the difficulty on their own. A padded seat and ergonomically correct foot pedals make the Favorit comfortable to use. A 285 weight capacity can be used by most people. Unfortunately, the Favorit cannot be folded up or easily taken apart for storage. It is, however, much more compact than most air powered rowers. Just to be on the safe side, make sure you’ve got enough space for the unit before purchasing. The Stamina 1445 Wave Water gives rowers a realistic experience with real water resistance. As you row, a series of paddles turn inside a water tank, providing a limitless stream of resistance that grows with difficulty the hard the user rows. The steel frame is fitted with wheels at one end for easy transport can easily be folded for storage in small spaces. A padded seat and handle provide comfort and good grip while rowing. The Stamina 1445 Wave Water also includes a built-in fitness monitor that allows users to track important stats like distance, time, stroke count, and more. 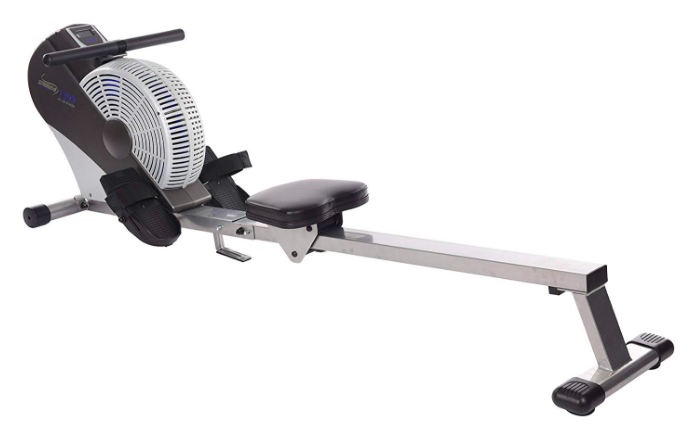 If you’re looking for a nice compact rowing machine, it’s hard to go wrong with the Sunny Health & Fitness SF-RW5515 Magnetic. 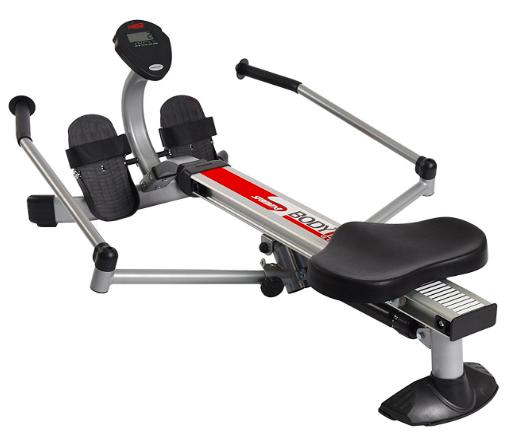 This rowing machine uses a magnetic resistance system that gives users to select from eight levels of resistance. 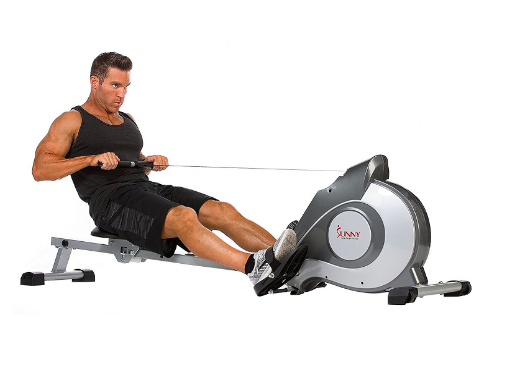 Resistance is controlled by a large dial right on the front of the machine and can be turned easily while seated on the rower. A nice big LCD monitor allows users to easily track things like time, count, calories, and more. Big, non-slip foot pedals and a cushioned seat and handle make this rower comfortable and safe to use. An all steel frame gives users solid support and long-term durability. For an inexpensive, compact design that doesn’t skimp on features, check out the Sunny Health & Fitness SF-RW1410. This machine is a very simple, hydraulic piston design that operates with a single piston and a pair of levered handles. The end of this rower folds easily, allowing the machine to be more easily stored in a closet or smaller space. An overall footprint of 59” by 29” means it will fit comfortably in smaller areas when in use too. The also has 12 levels of resistance and a built in LCD monitor to track time, count, calories, and more. If you really want to get back to basics with a compact, easy to store design, take a look at the Stamina InMotion Rower. 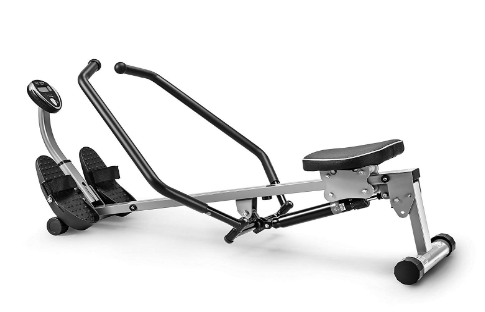 It is a truly compact rower with a footprint of just 56” by 19” when set up. Though it doesn’t fold, the InMotion Rower can easily be stored on its end in a small space. 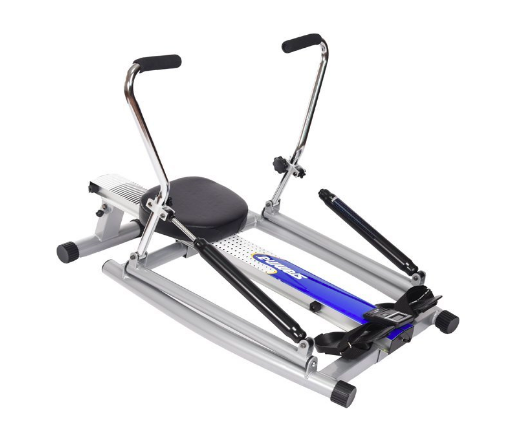 The InMotion Rower has five levels of adjustment with the single hydraulic resistance piston. Users also get a small LCD fitness monitor for tracking important workout stats like time, stroke count, and more. An all steal frame provides enough strength and durability to support rowers up to 250 pounds. 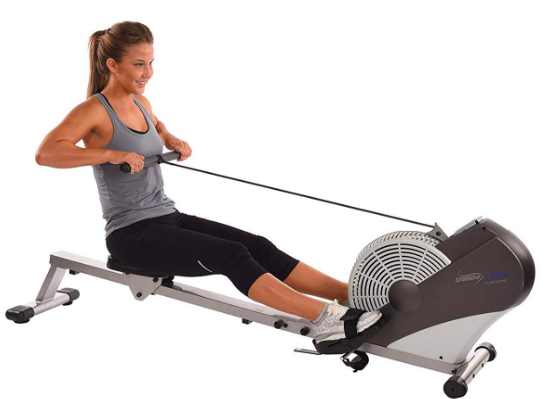 The Stamina Air Rower is a robust, compact rowing machine that’s made with a steel frame. For storage, and ease of use, it comes with a set of built in wheels and folds easily in half. As the name implies, this Stamina rower uses a fan for air resistance. Tension is not adjustable, but the resistance will naturally increase the faster the user rows. This rower also includes a fitness monitor that allows users to easily track important figures like distance, calories burned, speed, time, and more. A molded and padded seat keeps users in comfortably positioned while a padded handle and pivoting foot rests add grip and stability. For the money and compact convenience, it’s hard to go wrong with the Stamina ATS Air Rower. The Stamina ATS gives users plenty of resistance with a large fan that naturally, progressively adds resistance as speed increases. The built-in fitness tracker makes it easy to track progress and better understand how the workout is going. A folding frame and built in wheels make the ATS easy to store. 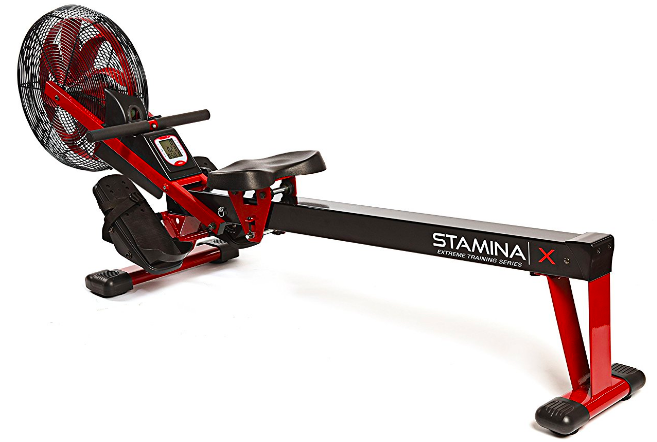 If you’re in the market for a compact rowing machine, check out the Stamina ATS Air Rower today.